Timber sales are probably the most important part of landowner’s management program. Timing and up-to-date knowledge of the marketplace are essential for success. There are many factors that can influence the price received from a timber sale. 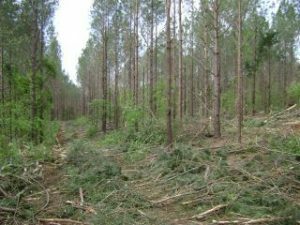 We continually monitor these factors and can advise landowners as to what, when and how to make good decisions related to timber sales. There are several approaches to marketing timber. We will use our knowledge, training and experience to help landowners decide which method is best to achieve your particular goals and objectives. In most situations the marketing approach will include an accurate timber cruise to determine the volume and value, a timber deed or contract to protect the client and their property, and supervision of the harvesting operation.